Ooooooh, I am so excited to share these products with you! I had so much fun playing with them myself that I figured everyone would want to play too! So, once you get some of the 'Swellegant' stuff in your studio, what do you do with it? Here's a bit of how-to, and some tips and other fun stuff you ought to know! The 'Swellegant' line is made up of five metal coatings, three patinas, thirteen dye-oxides and one clear sealant. All of the products are non-hazardous. If you would like the MSDS sheets for full details on their composition, those are available on my site. All have low or no odor and wash up with soap and warm water. Use common sense when using these, just like you would with any paint or craft product. Don't drink it, keep it out of your eyes, all that smart stuff. The metal coatings are finely ground metal suspended in a binder, and some of them do create natural expansion of gases, so when you open your metal coating bottles, aim away from yourself in case there is any blurping of liquid. The dyes will stain--they're dyes, duh. So wear rubber gloves and an apron if you think you're going to be messy (I'm messy, so I've found the gloves to be rather handy!). Shake all the bottles very thoroughly each time, before you use them. I find it best to pour out a little of whatever product you're using, then put the lid back on the bottle, since they all dry out when exposed to the air. Use the 'Swellegant' clear sealant to fix the coatings, patinas and dyes--it's made especially to go with the products! Other sealants, glazes and coatings might work (I haven't experimented yet with to tell you which to use and not use), but the clear sealant does work and does work well! 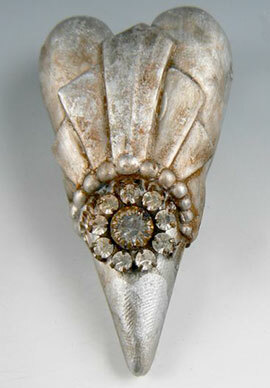 It is absolutely flat--it will not add any shine or interfere with the patina either! Just a little something to remember... let all the coatings dry completely for 72 hours before applying the sealer (it'll work much better this way... I know, I know... that requires patience, which I don't really have much of either, so we'll just all have to try our best together). The sealant works best applied in thin coats. You can add multiple coatings if you want. The metal coatings coat things with metal! Things that aren't metal, become metal (at least on the surface). Things that already are metal, can become a different metal, or can get a fresh touchup or accents of another metal color. 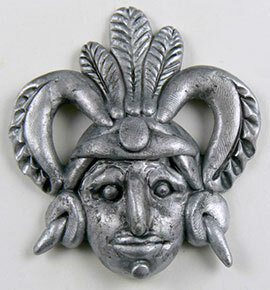 The metal coatings work on just about anything--wood, ceramic, polymer clay, resin, glass, foam, metal, plaster... experiment! 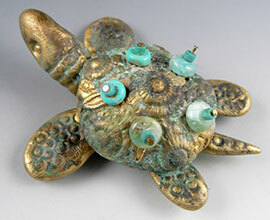 After you coat something with metal, you can add the patinas and dyes... more about that in a minute. 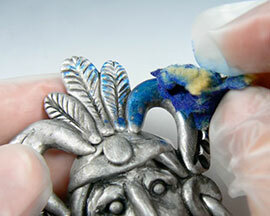 First step is to clean the surface of the item to be coated, if necessary. Soap and water will remove any oils. If the surface to be coated is slick or shiny, you may want to rough it up a bit with sandpaper or fine steel wool (if you're working on metal). If you're working on baked polymer clay, like I do, you don't have to do anything! Sweet, huh? Coat it! 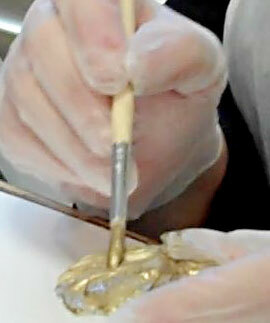 Use a soft brush to stroke/dab on the metal coatings. Cover it the best you can for the first coating. If there are thin spots, don't worry, you can get 'em on the next coating. 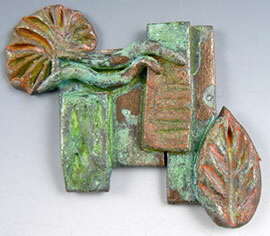 You can use more than one color of metal coating on the same piece--hey, mix 'em up and see what happens. 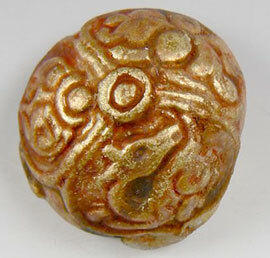 If you want to, you can brush the coatings onto unbaked polymer clay, and then bake it all together. Just remember to brush gently so you don't damage your clay details! Let the coating dry (5-15 minutes). Dab on a second layer of the metal coating! Make sure you cover any thin areas. If you dab-dab-dab with your brush (or even use a sponge to apply) instead of stroke, you'll create a more textured surface, which is will be just perfect later for accepting patinas and dyes. You'll notice that the metal coating is a bit thick, and may fill in some of your tiniest details--don't fight it! I Just make your creation more bold, with larger details and deeper lines and texture. Ok, this is important: before you add the patinas, dab on one more layer of the metal coating and while the metal is still moist, immediately add the patina -- use a brush or sponge to dab on a nice, juicy layer of patina all over the piece! (I like using natural sea sponges--very absorbent and nice, irregular patterning). 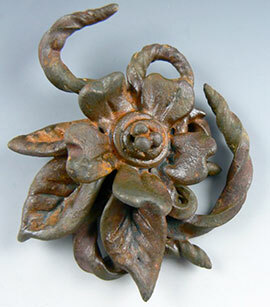 You can also put the patina in a spray bottle and mist it onto the piece. I really add a lot of patina! You can add more than one type of patina at the same time. 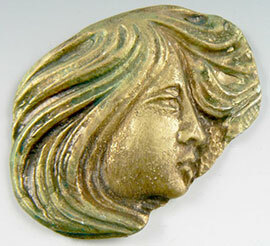 Or you can add one patina, then let that dry and add a different one. Or you can add patina layer after layer. Whatever! You can't do it wrongly. The darkening patina reacts very quickly--you'll see the dark starting up right away! 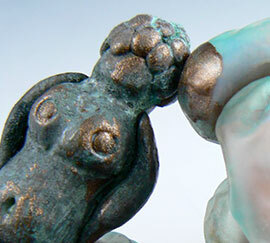 The Tiffany Green/Rust Patina and the Green-Gold/Verdigris Patina both take longer to react. Nothing will happen at first--don't worry, you haven't done anything wrong... just wait. Hey lookie! See that hint of green verdigris or blossom of orange-brown rust? ... that's the patina working! Keep checking every 5 to 10 minutes. There are several factors that affect how quickly the oxidation will occur--humidity, heat, how much chocolate you've eaten... wait, not that last one. It may take 15 minutes to get the color you like, or it may take two hours--that's part of the fun! The darkening patina darkens all the metals, Tiffany Green/Rust Patina and the Green-Gold/Verdigris Patina react differently depending on which metal they are dabbed on. Once you like how dark, how green-blue, how goldengreen or how rusty the patinas have made your piece, you can stop the reaction by rinsing the surface of your piece with water. I usually just keep a bottle of distilled water nearby and pour it over the piece each time I want to stop the reaction. (A little bowl underneath to catch the water is better than just spilling it all over the table, hee hee.) This will keep the patina as you see it, otherwise, it will just keep on oxidizing and deepening the patina--which you may like, or not. I find it best to rinse and then blot dry with paper towels once I like what I see. Of course you can keep adding more patina if the reaction isn't happening fast enough or intense enough for ya! 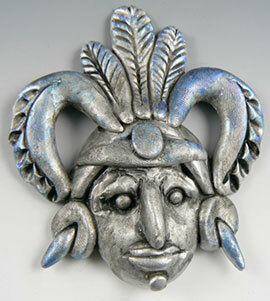 Remember that you can use these patinas to react with other metals, not just the metal coatings! Also remember that you don't have to use the patinas at all! If you want just the metal look! 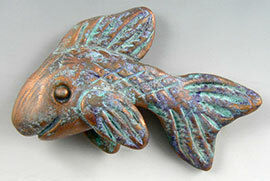 Or you can skip the patinas and go straight to the dyes! You just can't mess up!! As if coating something with metal and creating a real patina bloom weren't exciting enough, you can add colorants in the form of dyes! Whoooohooo! Here's where it really gets fun. These dye-oxides are a patina too, in that they soak into the metal and into the patinas to become part of the piece, not just a color that lays on top (not that there's anything wrong with that!) They are intensely colored, but transparent, which means you can add them to create just the whisper of color or you can really layer ‘em on to create and intense tint. Oh, just have fun! 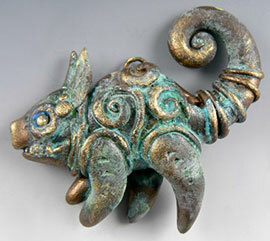 Add the dyes right on top of the metal coating and/or the patinas. Add one, add two, add all thirteen colors! Whatev! 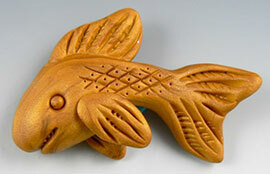 Use a brush or a sponge to dab the colorant onto the piece. Wipe off any excess. Let the dye soak in. Check the color in 5 to 10 minutes - you may need to add more dyes to reach the intensity you want. But isn't it nice to have the choice of being subtle if you wanna? No need to do anything special to halt the reaction. Just brush/blot on the dye and that's that! Ok, so now it's time to futz! Ain't that the fun of creating, anyway? All the foolin' and twiddlin' and fussin' and dabblin' that make the piece your own? Heck, yeah! So now, look over your piece. Did the patinas and dyes take over? Is the metallic color too hidden? Often that's the case--patina doesn't pay attention, it just oxidizes willynilly! So it's time to brighten up your piece, renew the metal glow! I find the best way to pop the metal is to use your finger (gloved, of course) to smear a bit of the metal coating right over the top of all the other colorants, hitting the highlights. Wow! 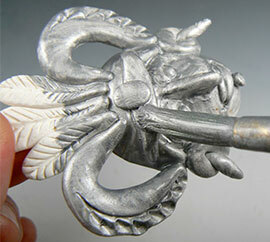 Using some of the underlying metal to re-touch the piece looks great, but no need to limit it to that. 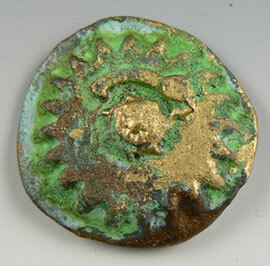 Often using another metal to hit the highlights can be really exciting. 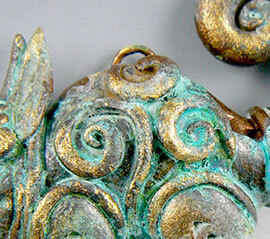 Using Brass to touchup Bronze is really affective. Silver over Iron is too. And hey, if you end up not liking it, re-coat it with the original metal and patina again. You don't have to be finished until you love what it looks like! Layering is your friend! 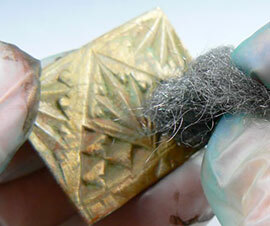 Add dyes to patinas, metals on the bottom, on the top, in between! Layer, layer, layer! You know you wanna! 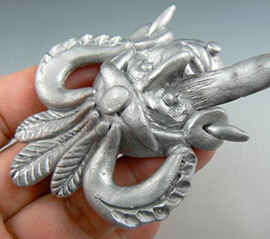 Another way to bring out the metallic glow is to burnish your piece. This can be done with a cloth, a burnishing wheel or 0000steel wool, but you must wait at least 48 hours (72 hours is better) before you burnish!!! This is because it takes a bit of time for the metal coatings/patinas/dyes to fully cure and attach themselves to the piece they've been applied to. Oh sure, they will all be dry to the touch within about 15 minutes or so, and yes, you can go ahead and wear or hang your piece, but just know that you'll have to finalize the last steps after waiting a bit. That's just the way it goes, don't fight it. If you choose to burnish (and you don't have to, it's an optional step) before the metal is ready, you may just scrape the metal off the piece. That would be silly. Burnishing with ultrafine steel wool (0000) is cool--it takes away the thin layer of patina from the surface and makes the metal glow. Try it sometime to see if you like it. All that is left is to add a protective coating! 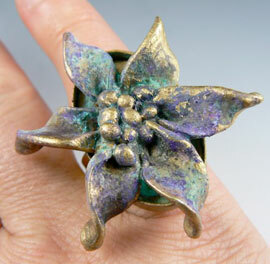 That's not necessary, but it does keep the patinas from rubbing off if you're going to wear the piece. Allow the piece to set for 72 hours before adding the clear sealant. Shake it thoroughly before using. Let me say that again, shake it thoroughly before using! Brush it on in a very thin layer (thick stuff gets milky looking, yuck.) Let it dry. Add another layer if you want to. The clear sealant is made especially to go with Swellegant metal coatings, patinas and dye-oxides. You can experiment with other coatings if you want to, but hey, the Swellegant sealant is cheap, so just use it, ok? So whadda' ya' think? Pretty cool stuff huh? Get out there and play! Don't be scared! What's the worst that could happen--you'd have to let it dry and paint it again?